After a lot of hard work I found myself signed up to raise money for the Movember Foundation by riding across Australia with Henry Crew. It would be the trip of a life time and after the initial high wore off, thoughts of logistics, riding gear, camping gear, food, fuel and all the organizational hours that would be required to make it a success began to roll through my mind. Staring in disapproval at this strange beach without motorcycles on it…….insanity. One of the biggest challenges with this trip would be luggage and organization for the gear I wanted to bring. I wanted to not only travel light but to be efficient as well due to my riding partner Henry, being in the middle of a world record attempt to be the youngest person around the world on a motorcycle. This was all shaping up to be quite an exciting adventure so I wanted some exciting gear to go with it. Ducati Australia/New Zealand was incredibly supportive with this venture, providing me with a beautiful Black Edition Desert Sled for the journey. 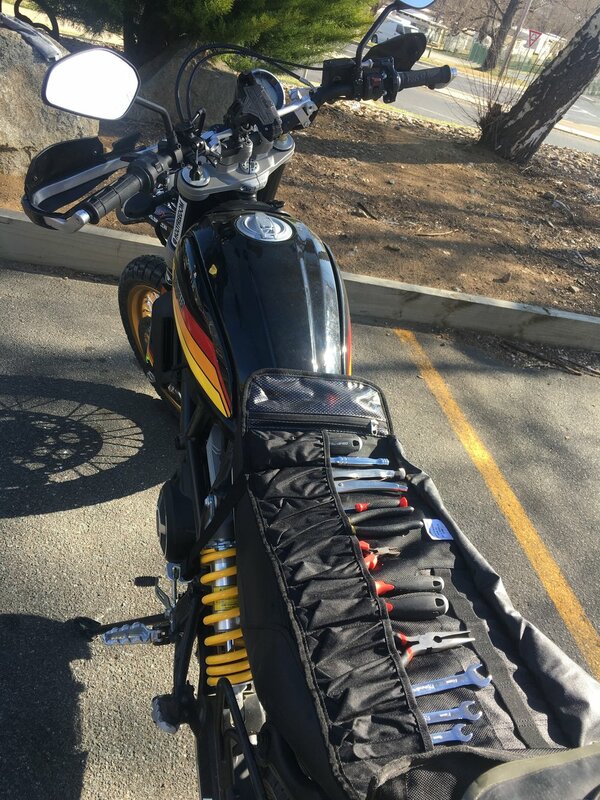 The Sled came fully equipped with a set of Scrambler panniers, tail and tank bag too however, even with that, I still needed a bit of extra space and some organizational accessories to make it all work. Front and Center - Velomacchi was overwhelmingly supportive of the effort to raise money for The Movember Foundation. With their help, Mike raised over $5000! Impact Storage Case for my Hard Drive, GoPro’s, Sim/SD cards etc. Speedway Gloves in Tan and Black……. (insert Homer Simpson drooling noise), separate blog post to follow on these beauty’s. Launching from Perth and clocking up nearly 7000km in the next 3 weeks, we would encounter nearly every type of terrain and weather that you can imagine. I wore the Speedway Back Pack EVERY day as we pushed hard to find the limits of the Desert Sleds on white sand beaches, dense forest trails, slippery salt flats, slimy tank-slapping mud, sharp rocks, bone jarring corrugated gravel and endless miles of well constructed highways in between. The unique shoulder strap design and chest lock mechanism not only look super cool in a futuristic, post-apocalyptic way (if that’s possible), they are extremely comfortable. Its a point of interest for everyone that you meet and makes donning it an occasion every time you hear the magnets spin the mechanism with a satisfying ‘click’. The chest lock, combined with the pivot point in the shoulder straps makes getting it on and off much easier than a conventional pack. Whether bouncing through he outback or sitting behind the bars for endless hours as the highway stretched out in front of me, the pack remained solid, in place and just kind of ‘melted’ into my torso even with the 1.5 L Hydration bladder in the available compartment. Sea to Snow - The Speedway 28L looked great despite the close proximity to my terrible beard and vacant facial expression. Of course riding, or doing any activity for that matter, over long periods of time with a pack on, will inevitably cause some fatigue and potential discomfort. I exercised some common sense and made sure to pack light, ensure the straps were adjusted properly and took the pack off when ever I stopped for fuel or to assist Henry as his Scrambler whenever his Sled took a ‘bike nap’ on his lower extremities. The pack preformed extremely well throughout and all claims that Velomacchi makes about its features and performance remain intact. After an hour in a massive downpour in Perth I can say the main compartment and front pockets are indeed very waterproof. The material is quite robust and along with a high quality feel, is rigid enough to resist flapping in the wind as you bend the speed limit on an open motorcycle across the Nullarbor plains. The well designed helmet clip was in heavy rotation, securely holding either my Lane Splitter or the multitude of ball caps dangling from it. Now lets be clear here. Velomacchi is a premium brand so expect to pay more than you would for some other conventional packs with similar features and functions. Why spend the extra $? Look at it this way, a New ZR1 Corvette will do 0-60mph in roughly the same time as a Ferrari 488 however, its just a bit more special in the Ferrari isn't it? Every aspect of the Speedway oozes style, quality and Velomacchi has built it to withstand far more wear and tear than any reasonable human would unleash on it. Its’ all very cool, exclusive and overdone. That’s what I love about it. Great Bike + Great Gear = Great Time!